Why is figure skating the most popular sport of the Winter Olympics? Sure, it’s partly because skaters seem to defy physics with their gorgeous arabesques and butterfly jumps. But it’s also because of the outrageous costumes. In sequin-bedazzled spandex, skaters use creative costume design to fuse sports with showbiz. Some glitzy getups enhance skating shows, but others are serious design crimes. 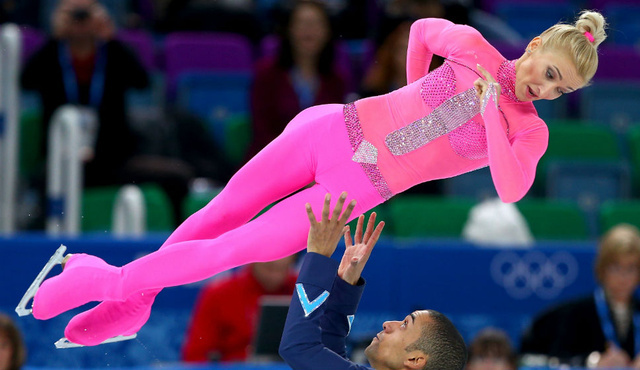 At Sochi this year, some athletes looked like they’d just skated out of a Renaissance Faire, while others channeled ’70s disco divas and pink highlighter markers. Co.Design tapped three fashion designers to give expert critiques of these costumes: New York-based women’s wear designer Ann Yee and Danielle and Jodie Snyder of New York-based jewelry line Dannijo. Here’s what they had to say. Ann Yee: This is not one of my favorites. I think the rhinestone placement is awkward and kind of distracting. I would definitely eliminate the strip down the center and the diamond/triangular shape, which looks like a giant arrow pointing to the skater’s crotch. Also I don’t think it’s a good decision using three different shades of pink in one costume. The neon pink is shocking enough–I wish the designer would have only used a single shade. It’s all reading a little cheap. 2. Julia Lipnitskaia of Russia, skating to the theme of Steven Spielberg’s 1993 Holocaust drama, Schindler’s List. Lipnitskaia’s red dress with gray accents was inspired by the film’s iconic character, “the girl in the red coat,” whose coat is the only splash of color in a black-and-white movie. Ann Yee: This costume is really beautiful. I’ve never seen a style like this on the ice. From the gray and red color combination, to the collar detail and gloves, it’s a very unique piece. The costume obviously has great movement and doesn’t look like it’s trying too hard. I like that’s it’s not your average, conventional costume and it has just enough “sparkle” without looking too cheesy or overtly “costume-y”. Elegant yet edgy, this one’s definitely a winner. Dannijo: Blades of Glory? Really too safe (but she was great!). Ann Yee: I love this look. It’s so fun and flirty. The stripes are great against the white ice and their varying pattern adds interest to the costume. I also like that her partner is in a dark pinstriped suit, which is a nice complement to her patterned look. I usually don’t like one-strapped garments, but this totally works here. The only thing I would eliminate is the fabric on her muscles–overkill in my opinion and doesn’t elevate the costume in any way. Other than that, this costume is adorable and definitely one of the better ones I’ve seen. 4. Jason Brown of Team U.S.A. dancing to “Question of U” by Prince. Perhaps more than his skating or his sparkly costumes, it was Brown’s ponytail that got the most attention this year. This celebrity ‘do now has its own Twitter account: @2014PonyPower. AY: Definitely prefer this look over the green laced-up top, but the sheer sleeves are killing me. He’s definitely rockin’ that tail. Dannijo: Is this a Napoleon Dynamite talent show? It’s really all kinds of wrong. AY: Not feeling this. Looks a bit cheesy and I don’t like the color combination of the red and sky blue. Dannijo: No. This is a Disney Princess costume. AY: I wish there wasn’t the squiggly embellishment detail down her center. Otherwise, I think the look is serving its purpose. The bright colors do look good against the ice. Dannijo: This is too costume-y and distracting. AY: Not my style, but it suits her. She looks confident, pretty, and youthful. Dannijo: This is soft and elegant with subtle touches of pastels, floral detailing and lace. Reminds us of a ’60s boho flower girl. 8. Meryl Davis and Charlie White of U.S.A.
AY: I think this pair actually looks great. All the embellishment doesn’t bother me here, it works. She looks elegant. Dannijo: Another case of Disney costume. 9. Elena Ilinykh and Nikita Katsalapov of Team Russia skating to Tchaikovsky’s “Swan Lake” in Black Swan-inspired costumes. AY: It’s hard to go wrong with black. I think this pair looks stunning. Dannijo: Love this–we appreciate a good feather costume (or feather anything…). AY: He’s totally owning this look!